It's interesting to me that in a film poised to revitalize the career of its star Michael Keaton, it is supporting actor Edward Norton who I can't seem to get out of my head. 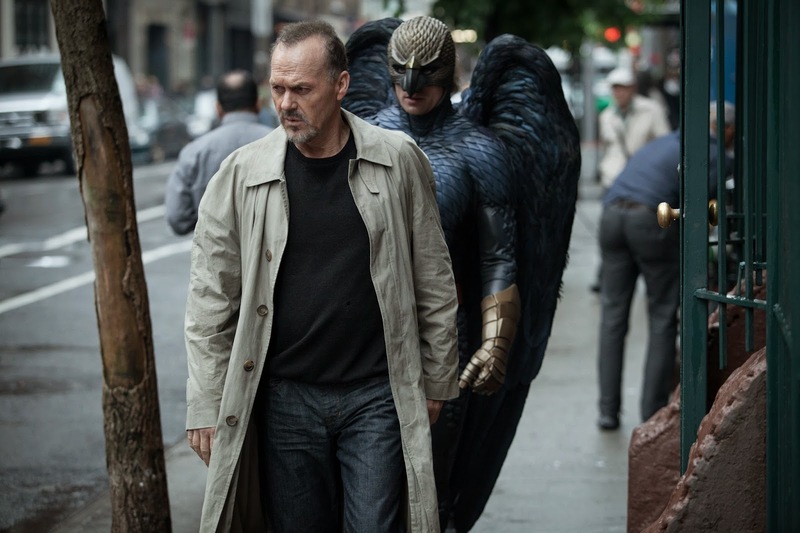 It's not because Keaton isn't spectacular in BIRDMAN (for the record, I've always known him as The Great Michael Keaton), it's that his character -- an old school superhero superstar-turned-flailing Broadway novice -- is so self-important, wallows in his own moroseness, desperately trying to rekindle his flamed-out celebrity status, such, you know, an actor that he just sorta drains all the energy out of the room. But Norton's character is the trendier version of him -- nihilistic, ubiquitous, self-indulgent but relevant and oddly entertaining. Keaton's character? He just crawls under your skin and stays there. This idea of generational celebrity shift as it pertains to one actor in competition with his former self or with another actor is the pulse of Keaton's performance and, in a sense, Norton's as well. Keaton plays Riggan, a washed up actor in the middle of probably his fourth or fifth career reinvention as the new Broadway star, director and writer (of course) of the upcoming show, What We Talk About When We Talk About Love (which is really just a story about Riggan, because he can't stop thinking about himself even when he's supposed to be writing about other characters). To say that Keaton's performance is art imitating life only reduces it and grossly overlooks the fact that the actor has consistently tackled a variety of roles that magnificently vary in not just intensity but quality as well -- an ideal resume for a role like this. Riggan is estranged from his straight-out-of-rehab, brutally honest daughter Sam (Emma Stone), and the closest thing he's ever come to a real relationship was years ago with his ex wife Sylvia (Amy Ryan), who's really just a distant friend out of obligation. Also, he can't seem to recapture the flourishing career he had back when he was once Birdman, a beloved superhero he played back in his heyday. No matter how hard he's tried to erase the alter ego from his celebrity image. Oh and... *cues the violins*. The list goes on and on. He's unhappy, underappreciated, and battling inner demons (in this case, Birdman himself -- who may be friend or foe). Until he's forced to take a look at himself once he finally opens his eyes to the fact that he just may never be a star anymore in a world in which celebrity is more viral sensation that an indicator of talent (he refuses to open a Twitter account). Meanwhile, his newly appointed co-star Mike Shiner (Norton) gets it: this is the guy who probably has about 75 social media accounts and has found a way to be on all of them at once. If tanning is considered cool at all, he'll sleep inside a tanning booth if he has to, he'll date every budding actress he can find and say whatever out-of-pocket drivel that pops into his mind just to be on the cover of a magazine. And yet, he's also quite talented. He's able to be so in control of his celebrity persona that it drives someone like Riggan absolutely crazy (which isn't really a far trip). He puts on the act, plays the game in order to, by his own account, be able to put that all aside to go full method on stage. Norton masterly walks a tightrope between charm and empathy -- and succeeds on both levels. BIRDMAN (OR THE UNEXPECTED VIRTUE OF IGNORANCE) presents a fascinating dichotomy, a character study of self-absorption in which even when they're speaking to one another, no one is really listening. With the help of composer Antonio Sanchez, director and co-writer Alejandro González Iñárritu draws you in to a series of tedious personal battles, heightened by the sound of jazz drum beats and the obsessive ticking of a clock as the story quickly unfolds within the tiny crevices of backstage at a Broadway theater. The physical and emotional claustrophobia is so unbearable that the actors playing the actors (I know, this is all so meta) often step out onto the street or onto the roof just to escape their own thoughts. In vain, because everyone else is out there doing the same thing but out loud. Iñárritu wonderfully recreates this ever hovering feeling of New York City's theater district -- down to the omnipresent racket of the random guy screaming on the street corner for no reason. But though it gracefully taps into the deterioration of the human spirit, there's a strangeness to this story. While each character desperately looks to maintain or acquire acceptance in a world where they don't really belong, including the smaller characters played by Stone, Naomi Watts, Andrea Riseborough and Zach Galifianakis, the element of the supernatural too often overwhelms these subtler, more touching nuances of the story. It's just so self-indulgent, so self-congratulatory from a filmmaker like Iñárritu (or any director, for that matter). There are a few scenes that I could have done without (watching Riggan literally fly high above buildings channeling Birdman is interesting in theory, but falls remarkably flat). Iñárritu often shifts from hyper meta to hyper extravagant any time he departs the snug safety and comfort of the St. James Theatre. The penultimate sequence in the film brings us back to the main stage where Riggan finds an ironic loophole in his dwindling sense of self-- one so perfect for the film that I wish it ended right there. But in a film like this that is part dark comedy and part melodrama, it is only the fictional characters who can prevail while the actors playing them ultimately concede to their existence out of necessity. I'd wager that BIRDMAN is the type of film that begs multiple viewings not only because it's worth the watch, but because there are so many new things you can pick up from it each time. The characters come alive with this rather random cast (outside of Keaton and Norton, who fit their roles like well worn gloves) that make much of the surrealism in the film work. It's not perfect (it can be exhausting at times, actually), but it says a lot about people, narcissism and the co-dependent relationship between actor and celebrity. BIRDMAN is in theaters Friday. Great review! This is actually the first time I've actually read a review about this film. I've just seen Emma Stone's name get thrown around for Oscar nominations. It sounds very interesting. Sounds like a wonderfully complex film, really looking forward to it. Good review Candice. You got deeper on the various metaphors and meanings in the film, but I dig that about you. LOL. I saw it yesterday and loved it! As a filmmaker I loved the way it was shot as in one long take. The flying scene? It's called 'Birdman'. It's nice to see that actually realized. I can see what you mean though about it not adding much, but I don't think it took away from the film either. I thought the perfect ending would have been on stage as well, but that would have been kind of "too pat" and expected for the film. The film's raison d'être was to tell a unique surreal story and I appreciated that about it. I and as I know you have seen innumerous films, so to tell a version that is unpredictable is appealing.